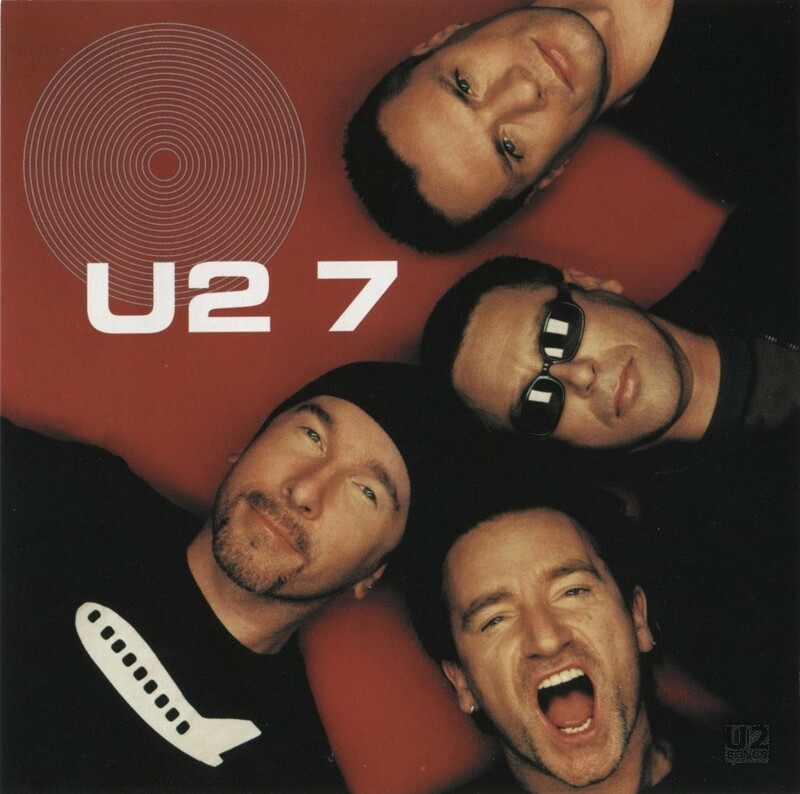 After not releasing any commercial CD singles in the USA during the promotion of All That You Can’t Leave Behind (the last U2 CD single to be released in the USA to that point was 1997’s “If God Will Send His Angels”), Interscope Records released a 7-track EP in the United States, available exclusively at Target department stores. It was named “7,” both for the number of tracks included and for the retail price, which was $6.99. The release came in a standard jewel case with unique cover art. A sticker affixed to the front of the packaging included the phrase “Rare and Remixed,” as well as the catalog number. A compilation of sorts, “7” featured a selection of tracks that had been released on CD singles from All That You Can’t Leave Behind around the world. Although technically a limited release, the CD could be found at all 1,055 Target stores on the day of release. It soon became difficult to find in stores. Like most retail exclusives of this nature, it was made available for a limited time and stock was not replenished. Although Target stores no longer carry “7,” it can be found fairly easily on the secondhand market. Tracks on “7 (Rare and Remixed)” include “Always” and “Summer Rain” (both originally from the “Beautiful Day” single); “Big Girls are Best” and “Beautiful Day (Quincey & Sonance Remix)” (originally from the Canadian “Walk On” and EU/Australia “Stuck in a Moment” singles); “Elevation (Influx Mix)” (from the “Elevation” single); and “Walk On (Single Version)” and “Stuck in a Moment You Can’t Get Out Of (Acoustic)” (from the Canadian “Stuck in a Moment” and EU/Australia “Walk On” singles). Only “Always,” “Summer Rain,” and “Big Girls are Best” had previously been commercially released in the USA, namely as single-track bonus CDs bundled with copies of All That You Can’t Leave Behind at certain retailers. More information about the tracks on “7 (Rare and Remixed)” can be found by following the links to the singles on which they appeared in other regions. Music by U2. Lyrics by Bono and the Edge. Produced by Daniel Lanois and Brian Eno. Engineered and mixed by Richard Rainey. Assisted by Chris Heaney. Music by U2. Lyrics by Bono. Produced by Daniel Lanois and Brian Eno. Engineered and mixed by Richard Rainey. Assisted by Chris Heaney. Music by U2. Lyrics by Bono and the Edge. Produced by Howie B and Flood. Assisted by Rob Kirwan. Engineered by Flood. Programming by Howie B. Original mix by Flood. Final mix and additional programming by Tim Palmer at Scream Studios, Los Angeles. Music by U2. Lyrics by Bono. Produced by Daniel Lanois and Brian Eno. Engineered by Richard Rainey. Assisted by Chris Heaney. Additional production by Steve Lillywhite. Mixed by Steve Lillywhite. Additional engineering by Tim Palmer and Stephen Harris. Remixed by Quincey and Sonance. Music by U2. Lyrics by Bono. Synthesizers by Brian Eno and the Edge. Produced by Daniel Lanois and Brian Eno. Engineered by Richard Rainey. Assisted by Chris Heaney. Original mix by Tim Palmer. Assisted by Alvin Sweeney. Remixed by Leo Pearson. Additional production by Johnny Moy. Remix Engineer: Richard Rainey. Music by U2. Lyrics by Bono. Produced by Daniel Lanois and Brian Eno. Engineered by Richard Rainey. Assited by Chris Heaney. Additional production and mixing by Nigel Goodrich. Engineered by Steve Orchard. Music by U2. Lyrics by Bono and the Edge. Mixed by Steve Lillywhite. Recorded by Martin Bohm, at MG Sound Studios, Vienna. Mastered by Arnie Acosta at the Mastering Lab, Los Angeles. Audio Post Production Manager: Cheryl Engels at Partial Productions Inc. Photography by Kevin Westenberg. Designed at Four 5 One Design, Dublin.